Henry Wu, CEO of Ryder Industries, is delighted to announce the company’s new website. 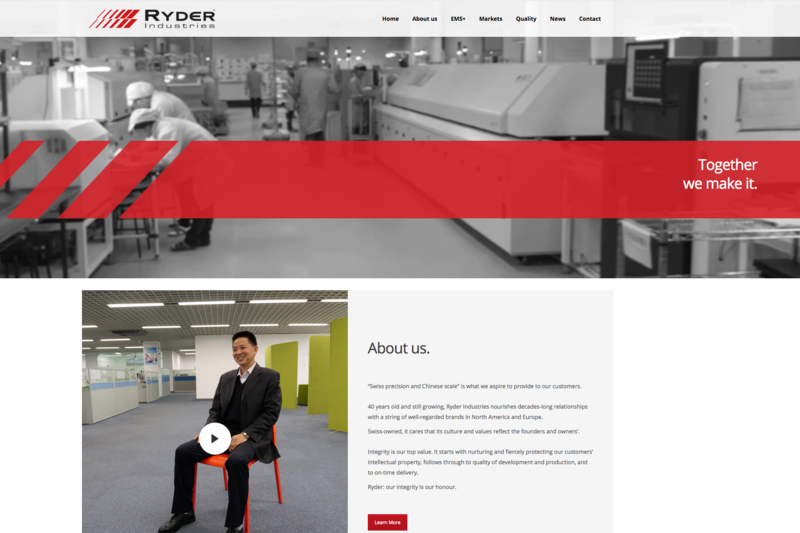 Ryder Industries, a leading Electronics Manufacturing Service provider, recently launched its new website –www.ryderems.com. The site reflects the company’s ongoing transformative success and updated brand identity. Ryder Industries’ facilities are based in China, benefiting from the scale and efficiencies of the country’s impressive supply chain, and driven forward by the intelligence, innovation and cohesion of these talented people. Within its two large, versatile facilities, one on the coast and the other inland, Ryder Industries puts together a custom solution for each client, providing scalable, flexible and robust product life-cycle management. The phrase “Swiss precision: Chinese scale” is a reflection of Ryder’s aspirations for their customers. With 40 years of experience, Ryder Industries nourishes decades-long relationships with a string of well-regarded brands in North America and Europe. The term “Swiss Precision” is at the core of Ryder’s culture, inspired by founder-chairman Eric Winkler. His laser focus on integrity and quality, along with the team’s skills in process and efficiency, yields a commitment to always delivering the superior Ryder Industries experience. “Chinese Scale” is a recognition of the location of Ryder industries’ facilities, benefiting from the scale and efficiencies of China’s supply chain, and driven forward by the intelligence, innovation and cohesion of Ryder Industries’ China teams.